Ran When Parked recently visited the Volkswagen museum in Wolfsburg, Germany. 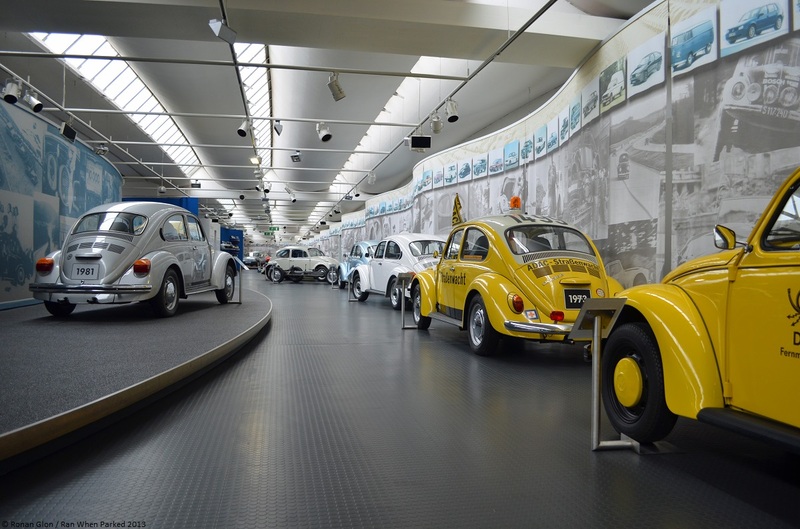 Not to be confused with the smaller museum in nearby AutoStadt, the collection on Dieselstraße is dedicated exclusively to Volkswagen-badged vehicles built since the company’s earliest days. The cars on display change on a regular basis but, generally speaking, the collection ranges from a 1943 Beetle to a late-model Scirocco in full race regaliar. The museum puts a heavy emphasis on prototypes and we saw a fascinating array of one-offs including a Karmann Ghia-like two-door sedan intended to replace the Beetle, the prototype that led to the Brasilia, a four-wheel drive bay-window Bus, a boxy three-door hatch that previewed the first-gen Golf / Rabbit and an experimental Passat GTI hatchback. The Plattenwagen, a hand-built pickup truck used to transport parts and passengers around the mile-long Wolfsburg factory and bring the workers tea, is also a must-see. Our favorite car in the museum was the EA-48, a tiny four-seater aimed at cars like the BMW Isetta and intended to slot under the Beetle as an entry-level offering. It represents a milestone in Volkswagen history because was the first car designed in-house without any input from the Porsche family. It was powered by a 700cc air-cooled flat-two engine that spun the front wheels – making it one of Volkswagen’s earliest endeavors in front-wheel drive – and propelled the car to a top speed of about 50 mph (80 km/h). Although it never reached production, the EA-48 accurately previewed the modern supermini: It featured a McPherson-type front suspension, a hatchback (not present on the prototype pictured below) and engineers even toyed around with the idea of fitting a two-cylinder diesel. Development carried on for about two years until Volkswagen head Heinz Nordhoff cancelled the car to prevent it from stealing sales from the Beetle, which was barely starting to catch on after a relatively rough start. Surprisingly, the final nail in the EA-48’s coffin came from the West German government in Bonn as the Minister of Transport was afraid a small car from Volkswagen would jeopardize vehicles built by Goliath and Lloyd. A second prototype was assembled in 1956 but scrapped when the project was shelved. The Volkswagen collection is not as busy as the museum in AutoStadt and it is very well lit so bringing a tripod is not necessary. Located several miles away from downtown Wolfsburg, it is open weekdays by appointment only. In the interest of space we have largely left out detailed shots (door handles, headlights and so forth) and regular-production cars – a flawless Beetle convertible is a sight to behold but it pales in comparison to a four-door Beetle taxicab or a convertible used by the German police in 1949. If you would like more pictures of a particular car or of the museum in general don’t hesitate to contact us, or better yet, visit the museum for yourself in Wolfsburg, it’s well worth the trek. The museum is split up into air-cooled and water-cooled vehicles, we’ll do the same for the gallery. If some of the pictures look blurry in the preview, click “view full size” on the bottom right of the preview to see a full, sharp image. Wow!.. Some of these designs, especially in the air cooled section, Where so very cool! Too bad they didn’t market them in the U.S.A. Even if they had been a loss leader for VW just to expose America to the brand, they might have taken a major jump ahead of the Japanese. Very nice feature! You are fortunate to live in Europe. Kudos for getting picked up by Autoblog.com. Living in Europe means easier access to museums, yep. We also covered the Citroen museum, the Alfa museum (now closed) and Italy’s national transportation museum. I must have been there on a nicer day – the top was down on the Corrado! Nice shot, I would have liked to see it with the top down. Shame they didn’t produce it even as a limited-edition model. Nice pictures and write-up here too! I’ll reiterate what you’ve said: The Autostadt is cool, but if you’re in Wolfsburg and love VW’s, be sure to stop by Dieselstraße. It’s simple yet well-stocked. I e-mailed the museum and they did not say anything about only open by appointment and not on weekends. Do you visit there a while ago? I am going later this month and am a little concerned since reading your article. That’s weird, I got the info through one of VW’s PR guys. Do you know what day you’ll be there? If I were you, I’d email them saying “I will be at your door on this day at this time, will someone be there to let me in?” just to make sure you don’t trek out there for nothing.